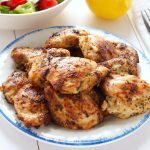 Paprika chicken is an delicious and easy chicken thighs recipe that’s perfect for a Sunday dinner, but impressive enough to serve for a holiday meal. 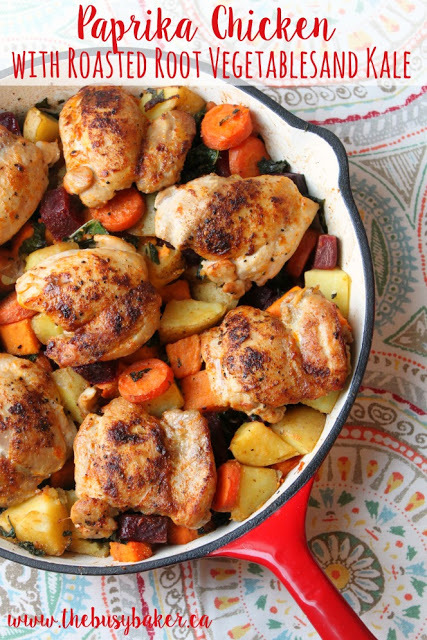 This healthy chicken dinner is packed with healthy smoked paprika, roasted vegetables and kale. For people who love to cook, sharing recipes between friends is really something special. 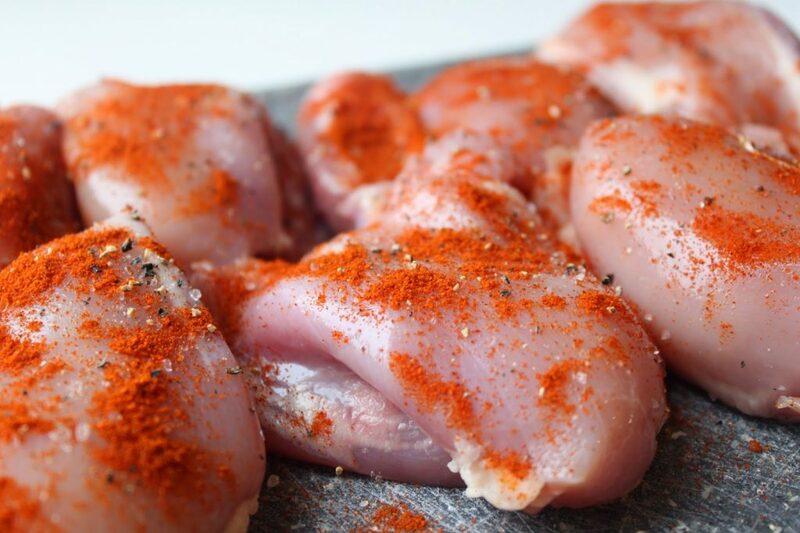 One of my very dearest friends (you can visit her blog here) shared this paprika chicken recipe with me a few months ago when our families got together for dinner. She made this dish for us, and it was the best thing I’d eaten in a long time! 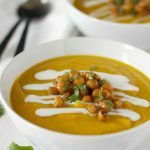 I just had to add it to our regular meal plan because it’s so tasty and healthy. In fact, I went out a few days later to buy the ingredients to attempt it myself. I’ve put my own spin on the paprika chicken recipe and it has quickly become a family favourite at our house. I have a hunch you’ll love it that much too! 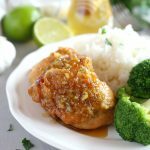 Do you love easy chicken recipes? Make some Easy One Pan Orange Ginger Chicken or this Easy One Pan French Onion Stuffed Chicken . What is paprika good for? Because of its anti inflammatory properties, paprika also helps with indigestion, cardiovascular health, and circulation. 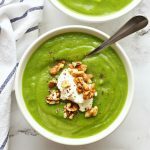 My friend originally followed a recipe from her sister-in-law’s blog (found here), and another blogger I follow created a similar recipe that I also used for inspiration (although the methods are very different). You can find it here. Start by prepping your vegetables. Feel free to use root vegetables that your family prefers. Wash, peel, and chop your root vegetables into pieces as uniform in size as possible. Peel and chop the beets last (if you’re using them), since their juices dye just about anything they come into contact with once they are peeled. 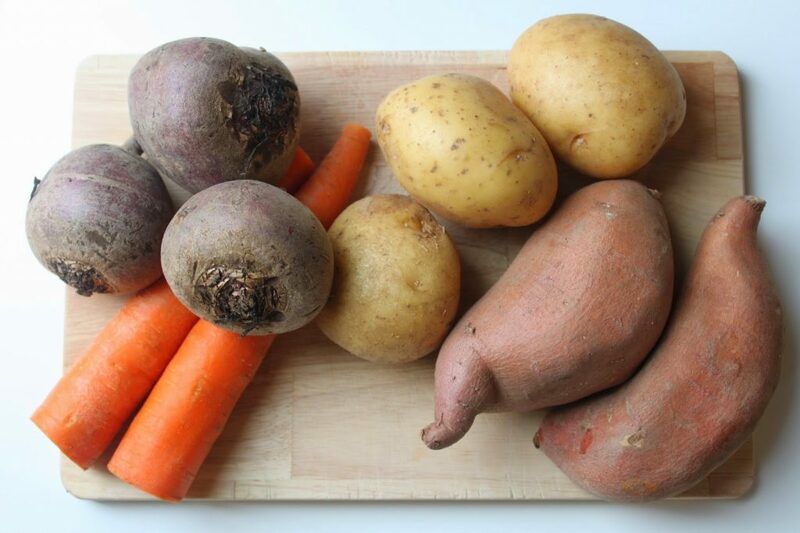 I loathe peeling vegetables, so I only peel the sweet potatoes and the beets and leave the skin on the carrots and the potatoes as long as they’ve been washed well. Now is also a good time to stem and chop the kale. You can chop the kale as finely as you wish; our kids find it easier to eat if the pieces are smaller, so that’s what I do. But if you prefer larger pieces, then chop it according to your preference. Once the kale has been chopped, set it aside and roughly chop and set aside the onion as well (if you’re using it…my 2 and a half year-old daughter is on an onion strike at the moment, so I left it out). 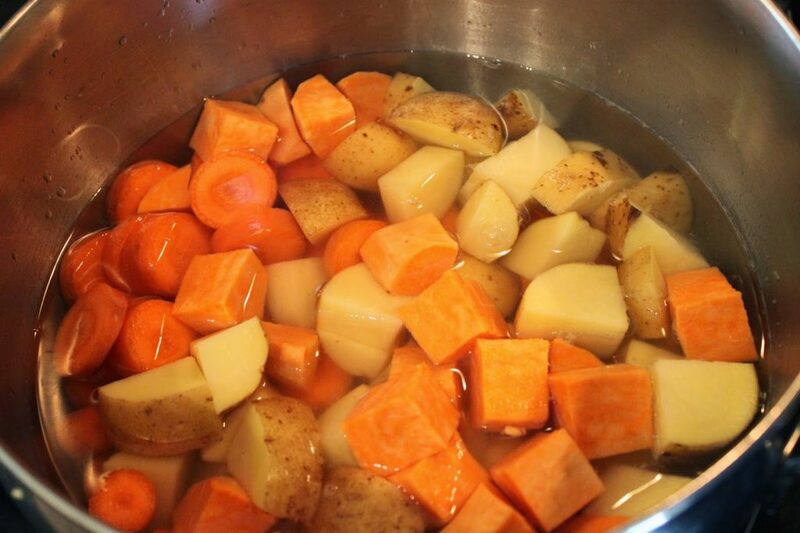 Add the potatoes, sweet potatoes and carrots to a pot and add water until they’re almost covered. Set the pot over medium-high heat and cook the vegetables for about 8 minutes or until they’re only slightly under-cooked and still on the firm side (you can check them with a fork). Add the beets to a separate pot and cook them for the same length of time. This may seem like an unnecessary step, however if you add the beets to the pot with the other vegetables everything will be a big purple mess. While the vegetables are cooking, preheat your oven to 375 degrees Fahrenheit. 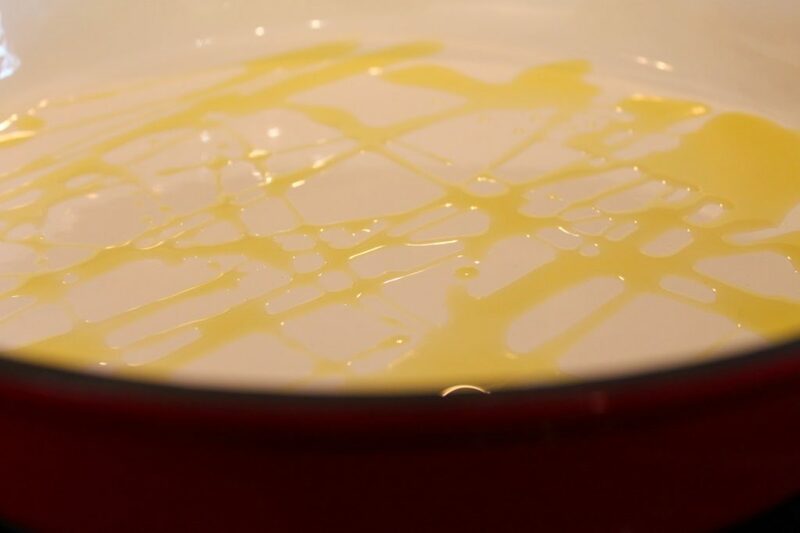 Place a heavy-bottomed saucepan (preferably one that’s oven-safe) over medium-high heat and add some olive oil to the pan. While the pan is heating, season the chicken thighs with salt, pepper and 1 tbsp of paprika on the top-sides only (you’ll season the bottom sides in a minute). Add the chicken thighs to your saucepan upside down (seasoned side down). Once the chicken hits the pan, don’t move it for several minutes. This allows it to brown deeply and evenly, developing lots and lots of flavour. If you’re worried about it burning, turn the heat down to medium, but be aware that turning the heat down too low can prevent browning. While the thighs are browning, season the other side with more salt and pepper and sprinkle on the remaining 1 tbsp paprika. The goal here is not to cook the chicken thighs through completely, but to achieve a nice brown colour on both sides before they go in the oven to finish cooking through. While the chicken thighs are browning, it will likely be time to remove the root vegetables from the heat. Use a colander to drain the water and set the vegetables aside for a moment. 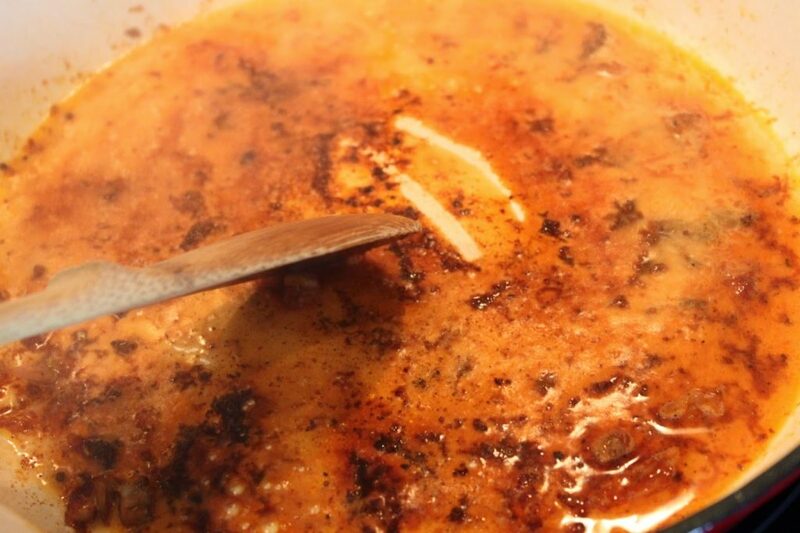 Once the other sides of the chicken thighs have browned, remove them to a plate using a set of tongs, leaving the pan on the heat with all the chicken juices left behind. Add a few splashes of white wine to the pan and stir up all the little brown bits left behind from cooking the chicken. Continue stirring until you can see that about half of the liquid has evaporated. 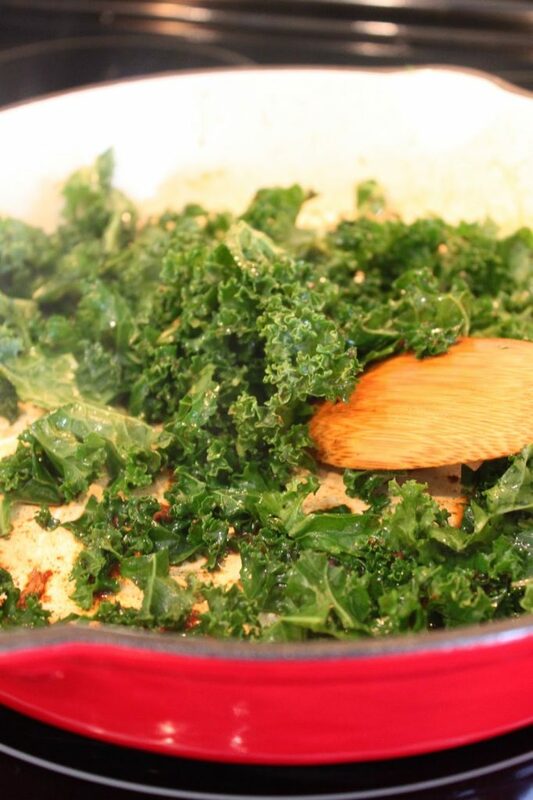 Add the kale and the onion (if you’re using it) and stir them around in the pan, allowing them to pick up all the flavour of the chicken bits, the paprika, and the wine. When the kale begins to wilt and the onion begins to soften, remove the pan from the heat. Add the root vegetables to the pan and sprinkle some more salt and pepper on them before tossing them with the kale, the onion and the leftover sauce you’ve just created as you’ve deglazed the pan. 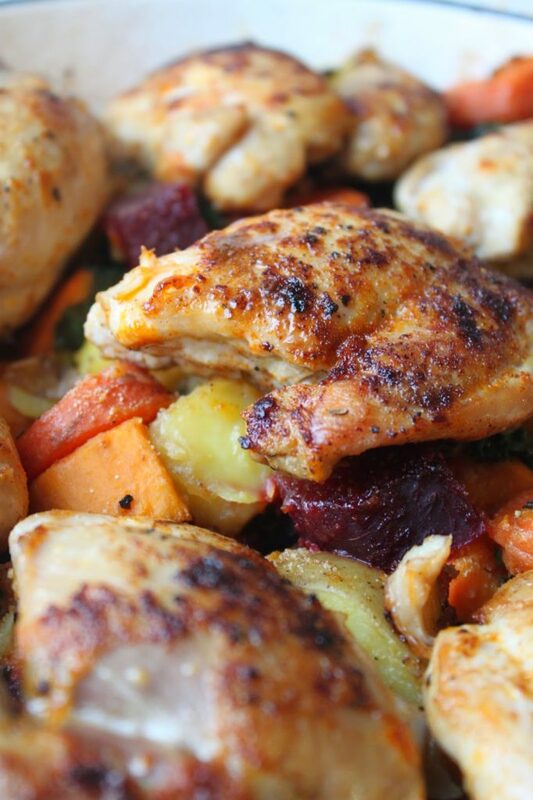 Lay the chicken thighs on top and nestle them into the root vegetables. The paprika chicken looks pretty good so far, doesn’t it? Everything is only partially cooked, but the heat of the oven will finish it off. Transfer the pan to your oven that’s preheated to 375 degrees and let it roast for about 25 minutes or until the chicken thighs reach an internal temperature of 165 degrees. 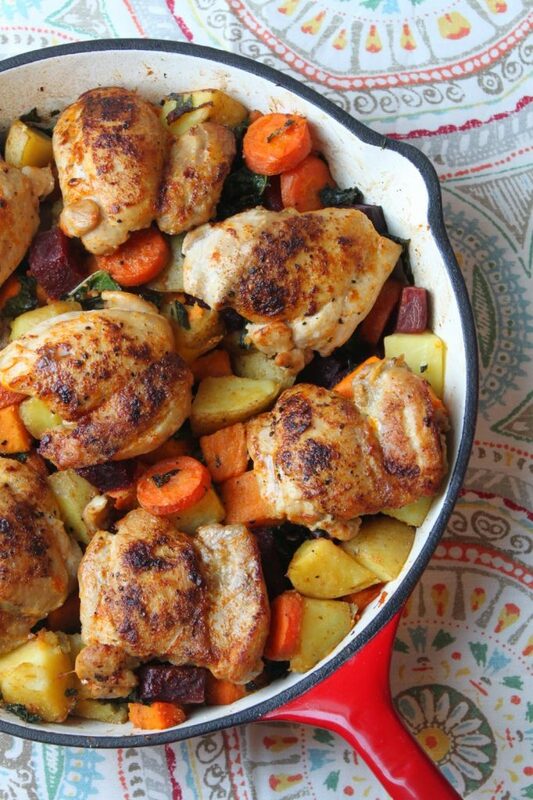 Remove the pan from the oven and let the chicken and vegetables rest in the pan for a few minutes before serving. You’ll notice the brown colour on the chicken will deepen as it roasts in the oven and the vegetables will soften in the middle and may turn a little crispy on one side (especially the potatoes). I hope you enjoy the paprika chicken dinner! Want more chicken dinner recipes? 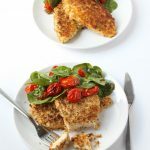 Try this Honey Garlic and Lime Chicken or my Chicken Milanese with Roasted Tomatoes and Spinach! Do you love roasted vegetables? Make some Garlic Butter Roasted Carrots or this Easy Healthy Roasted Vegetable Soup . This paprika chicken recipe serves 4-6 people, but it could easily be modified to increase the number of servings (using a large casserole dish). One serving (2 chicken thighs and 1 heaping cup of vegetables) is only 10 WW PointsPlus. This dish is comfort food at its finest, yet it’s guilt-free and full of nutritious ingredients. 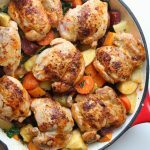 This Paprika Chicken is a delicious and easy chicken thighs recipe that's perfect for a Sunday dinner, but impressive enough to serve for a holiday meal. Wash, peel, and chop the root vegetables into pieces as uniform in size as possible. 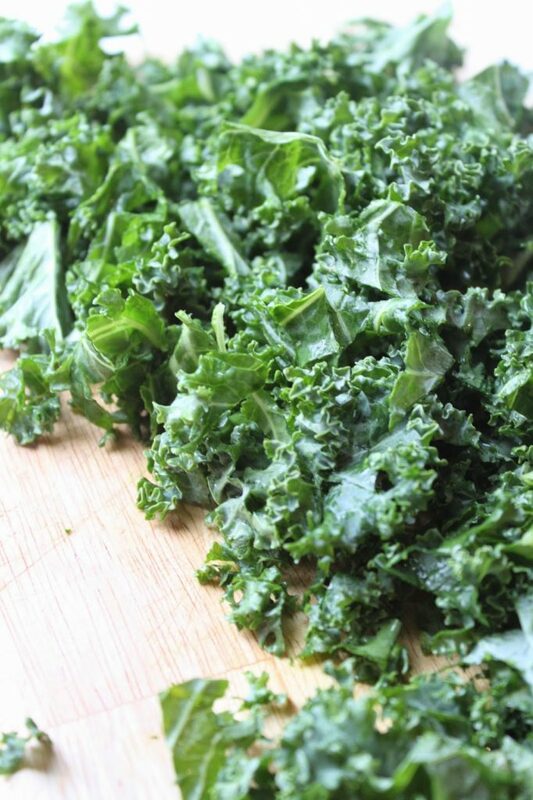 Remove the stems from the kale and chop into small pieces. Set aside the chopped kale and onions for now. Add the potatoes, sweet potatoes and carrots to a pot and add water until they're almost covered. Set the pot over medium-high heat and cook the vegetables for about 8 minutes or until they're only slightly under-cooked and still on the firm side (you can check the doneness with a fork). Add the beets to a separate pot and cook them for the same length of time. This may seem like an unnecessary step, however if you add the beets to the pot with the other vegetables, everything will be a big purple mess. Place a heavy-bottomed saucepan (preferably one that's oven-safe) over medium-high heat and add some olive oil to the pan. While the pan is heating, season the chicken thighs with salt, pepper and 1 tbsp of paprika on the top-sides only. 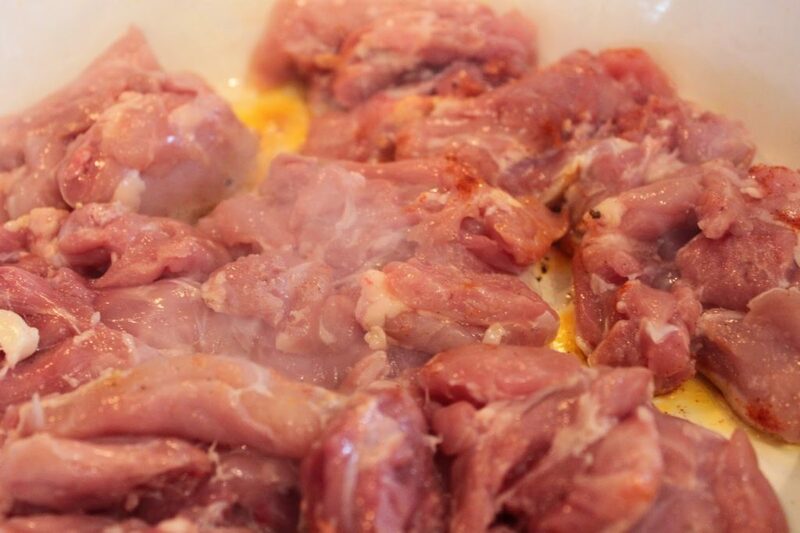 Add the chicken thighs to your saucepan, seasoned side down. Once the chicken hits the pan, don't move it for several minutes. This allows it to brown deeply and evenly, developing lots and lots of flavour. If you're worried about it burning, turn the heat down to medium, but be aware that turning the heat down too low can prevent browning. 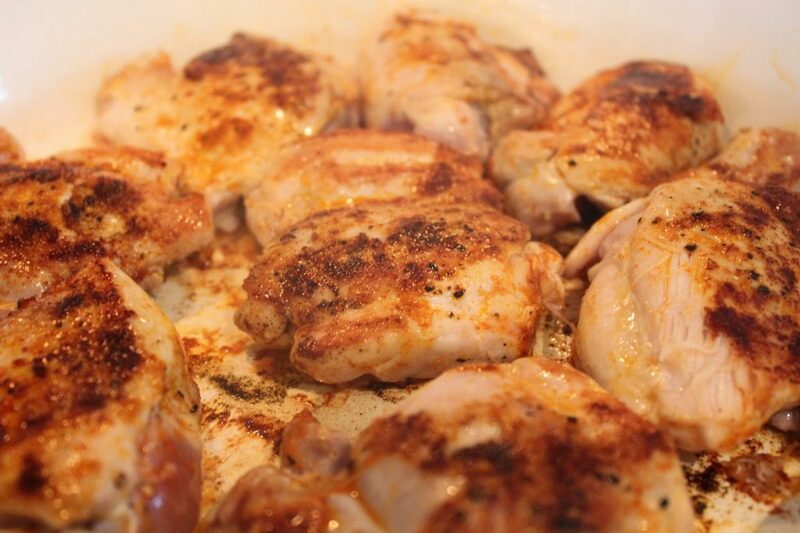 Once the chicken thighs have browned on one side, turn them over to brown on the other side. The goal here is not to cook the chicken thighs through completely, but to achieve a nice brown colour on both sides before they go in the oven to finish cooking. While the chicken thighs are browning it will likely be time to remove the root vegetables from the heat. Use a colander to drain the water and set the vegetables aside for a moment. Add the kale and the onion and stir them around in the pan, allowing them to pick up all the flavour of the chicken bits, the paprika, and the wine. When the kale begins to wilt and the onion begins to soften, remove the pan from the heat. Transfer the pan to your oven that's preheated to 375 degrees and let it roast for about 25 minutes or until the chicken thighs reach an internal temperature of 165 degrees. 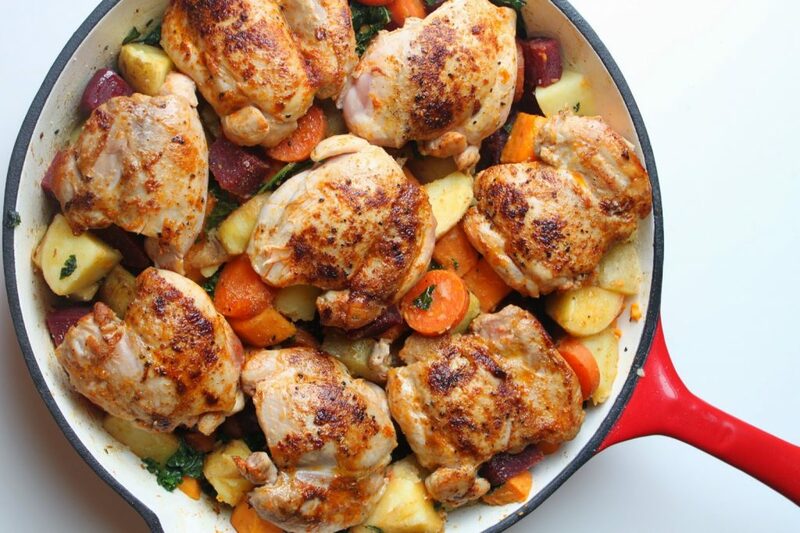 Remove the pan from the oven and let the chicken and vegetables rest in the pan for a few minutes before serving. You'll notice the brown colour on the chicken will deepen as it roasts in the oven and the vegetables will soften in the middle and may turn a little crispy on one side (especially the potatoes). This looks mouthwatering. I would never have thought about combining these flavours. I've pinned your recipe so that I can come back to it. Stopping by from Mom Bloggers. Thank you for stopping by! Let me know when you make it yourself 🙂 I'd love to hear what you think! I love the combination of the beets added, one of my favorites. 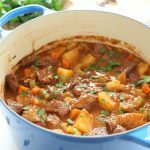 This is the perfect fall meal and it going on my "to make" list! What a delicious dinner meal, I can't wait to make it. Beautiful! Great combos of recipes! 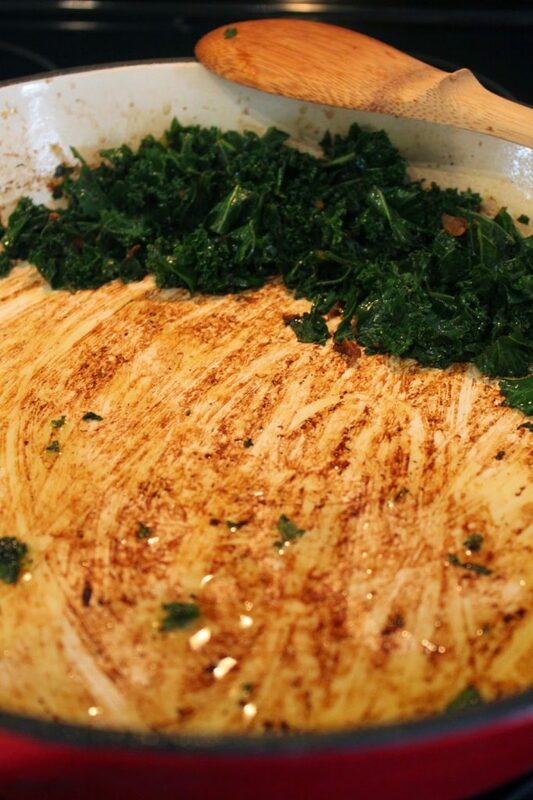 Looks like the perfect dish for Fall. 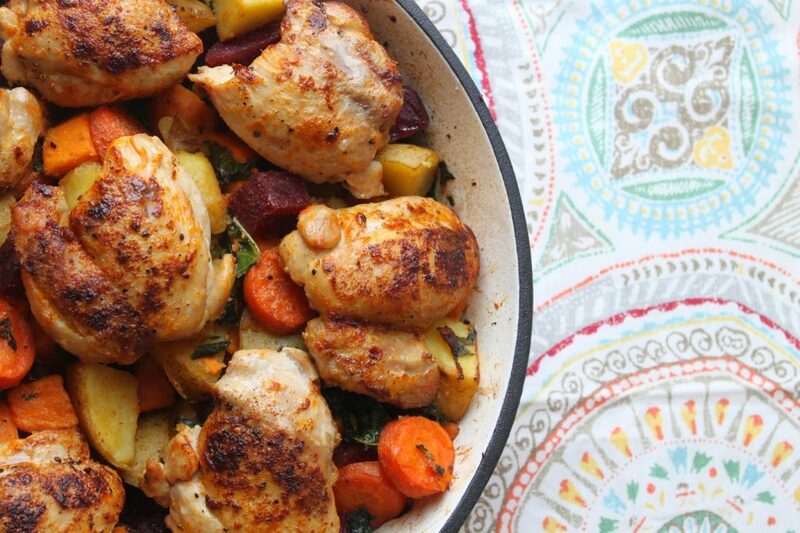 Love how you put this together — all that chicken wonderfulness dripping into the potatoes while it bakes adds so much flavor! This dinner looks so good. You have that chicken just perfect! I love the golden brown crispy skin. All in one pan cooking is my favorite! Yum! Thank you for this delicious dish. My whole family said this is a keeper! I had to adapt it a little to use up veggies I had. I used sweet onions, baby carrots, golden beets, red beets, and baby broccoli. I layered the root veggies and steamed them while I browned the chicken. Then I laid the broccoli on top before placing it in the oven. It was visually beautiful and tasted amazing! Yum!